If you love watching videos of cakes getting enrobed with a thick, shiny layer of glaze, we’re here to tell you that it’s even more fun to DIY. Things can get a little messy with a mirror glaze cake, so line your baking sheet with foil to catch all the extra run-off, this way you'll have easy cleanup. Separately prepare a plain white cake, from a box mix or following your favorite recipe, and frost it with buttercream. 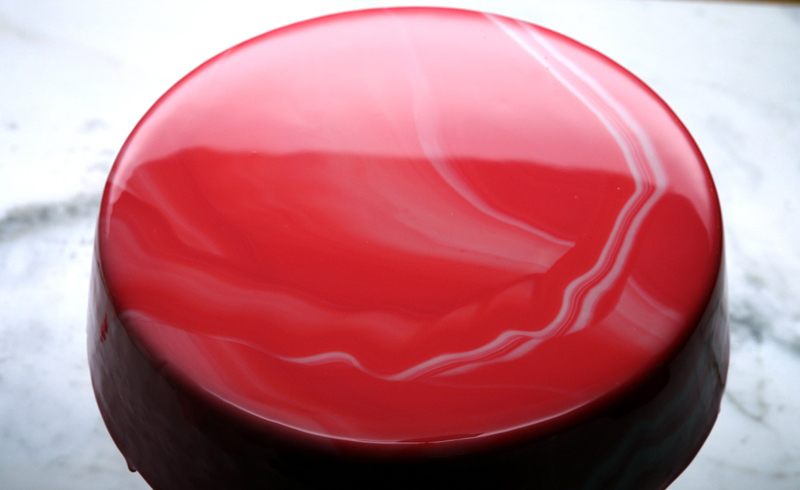 Place in freezer for 3 to 4 hours before you plan to add mirror glaze. To make the glaze, add sugar, sweetened condensed milk and water to a medium saucepan over medium-low heat. Stir occasionally. Mix gelatin powder and water together in a separate small bowl. 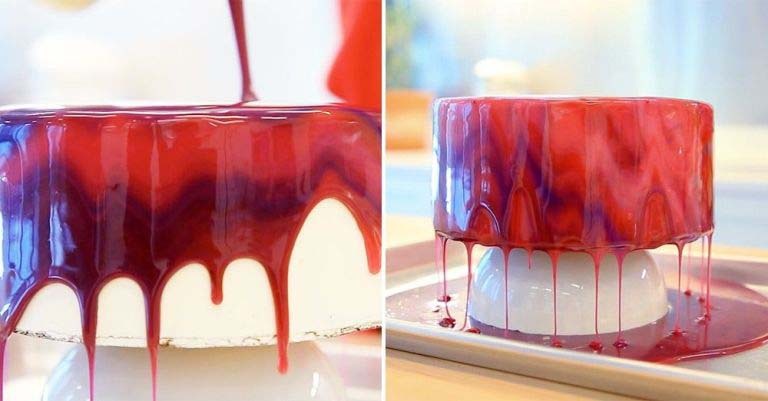 Let gelatin bloom for a few minutes. When the sugar, sweetened condensed milk and water start to simmer, remove from heat and stir in the gelatin until it dissolves. Add in white chocolate chips and whisk until the chips completely melt. Strain glaze through a fine-mesh sieve into large bowl, let cool for 10 minutes. Divide glaze into four small bowls. Choose 4 different, but complimentary, food coloring hues. Then add drops of single gel food coloring into each separate bowl until well mixed and the color you want. Pour half of one color of the glaze mix into a separate large bowl. Then, pour half of all the other mixed colors until you have four circles of glaze layered inside the bowl. Repeat the same process with remaining glaze. Do not stir the glaze in the bowl when finished pouring. Place a separate bowl upside-down inside a rimmed baking sheet, lined with foil to catch any drips. Set your already-prepared buttercream cake on top and begin pouring glaze over cake in one long pour. The colors should appear to swirl and mix. Let the glazed cake set for 10 minutes, then use a spatula or butter knife to remove drips from the bottom edge and create a clean line. Allow the entire cake to set in the fridge for 1 to 2 hours before serving.